My short answer is “I don’t”! When it comes to kid’s clothing (and adult clothing) I truly do not store much of anything outside the clothing we actually wear right now. I don’t buy ahead, we purge anything that’s too small (grown ups too! ), and we don’t rotate clothing based on the season — we keep all our clothing in our closets and drawers all the time. 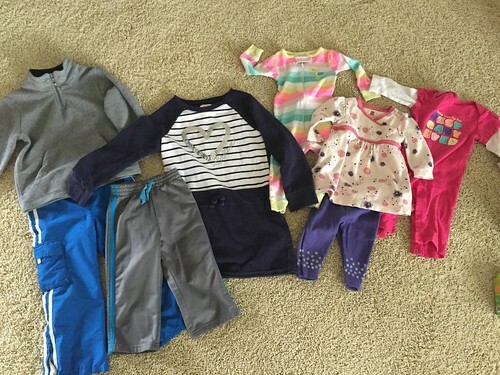 I realize this might sound crazy to some of you — but with the ages, sizes, and genders of our kids (and the fact that we have AMAZING thrift stores so close by), it just hasn’t made much sense for me to buy ahead or save out-grown clothing… let me explain more! I guess part of my rationale for this is simply the fact that I don’t want to store items for extended periods of time. Plus, the few times when I actually did buy something ahead of time, the items rarely fit the right person at the appropriate time of year as the child grew faster or slower than I anticipated. It just doesn’t seem worth it to me when we can find anything we need or want at a local thrift store for $1 and know it fits RIGHT NOW and my kids actually like it RIGHT NOW, and will wear it RIGHT NOW! I do have one drawer of too-big clothing for Clara (thanks to freebie hand-me downs from a neighbor and a friend from church). Any time these ladies give me clothes to look through, I keep the few items I’m almost positive will work (non seasonal items, jeggings, neutral shirts, etc.) and donate the rest. I also have one small drawer of clothing Simon has grown out of that I’m almost positive will eventually work for James. However, as you’ll read below, there aren’t many clothing items that end up working for both boys. 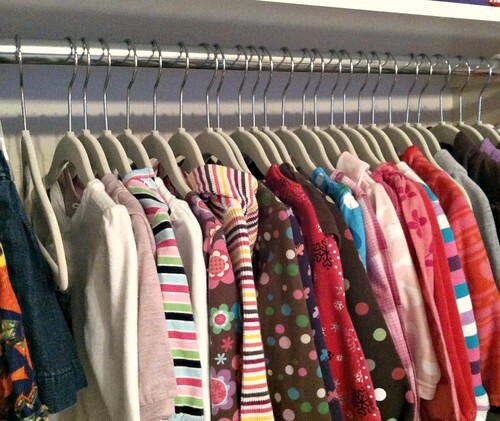 I’ve shared some of my reasons for purging all my kid’s clothing before… but here are a few of the main reasons. Since 99% of all our children’s clothing are free hand-me-downs or $1 thrift store finds, I do not feel guilty purging all our outgrown items. We give some of Nora’s nicer clothing to our next door neighbor girl (the rest is donated). Some of Simon’s clothing is put in the drawer for James, but most of it goes in the trash (seriously, this boy ruins SO many clothes). James clothes go to our nephew who lives just down the road. Clara’s clothes go to the thrift store. As I mentioned above, our entire family keeps ALL our clothing in our closets and dressers all year long. We truly do use and wear most of our clothing all year long — maybe not shorts in the winter, but we definitely get use out of pants and sweatshirts on cool summer nights. As for swimming gear and snow gear, we keep that all in the mudroom all year long — the snow pants, hats, scarves, gloves, boots, etc. are on the left side of the closet. The swim suits, cover-ups, goggles, sunglasses, sun screen, and pool toys are on the right side of the closet. 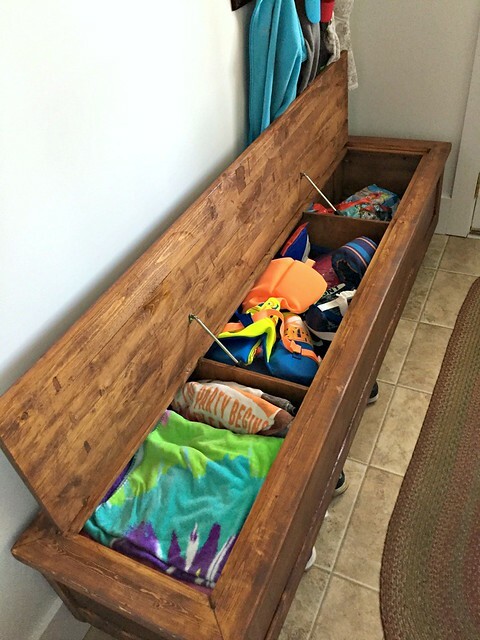 We keep towels and life jackets in the storage bench. We also purge many of these items at the end of the season as I know they won’t fit again the following year. 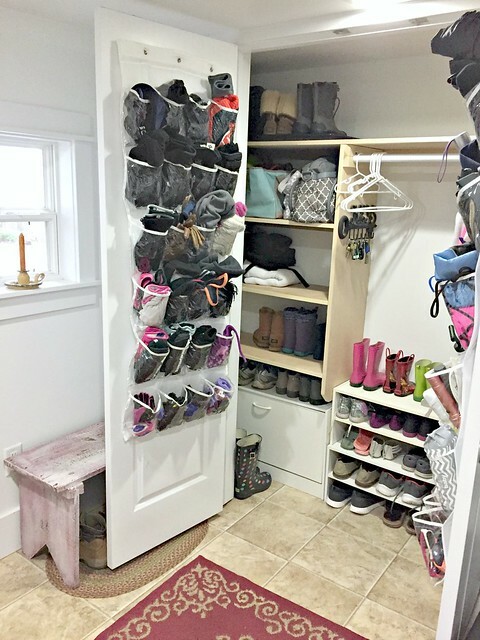 Yes, I could create a lot more space by storing off-season items in a different place, but we have plenty of storage space in our mudroom, and we get much more use out of our clothing by keeping it IN our closet and visible all year long. Obviously, if buying ahead, handing clothing down to younger siblings, and rotating out seasonal clothing works for you, THEN KEEP DOING IT! I grew up in a family of all girls, and we passed clothing down ALL the time… my mom also ALWAYS shopped ahead and bought clearance items many months in advance of when we would actually wear the clothing. 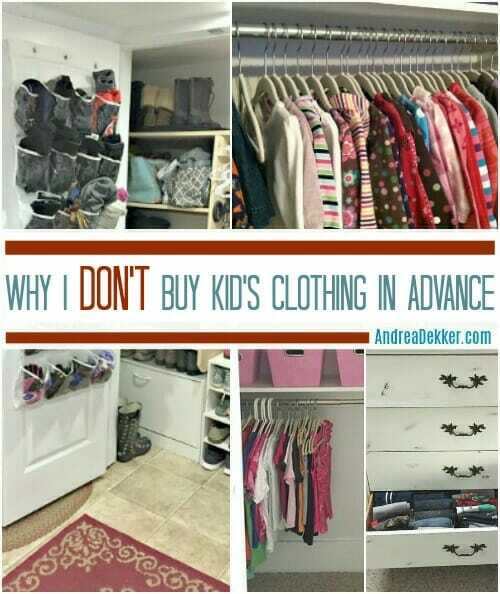 My main goal for this post is simply to share WHY I have chosen not to buy ahead, WHY I purge my kids outgrown clothing, and WHY I don’t rotate clothing based on seasons, as these are questions I get asked ALL the time. How do you (or did you) handle kid’s clothing? I loved buying ahead even if it meant storing things. I had a big bin in one closet and at the beginning of each season my daughter and I would do a fashion show. I would dress her in all her cute new things. take pictures and have her walk down the “runway” aka coffee table. She loved it and I would get a good idea of what would work that season or what was a miss to resell or donate. I usually was on target. I never spent a lot–it was all clearance, garage sale or resale finds and it gave me peace of mind to know that if I lost my job or something at least my kids would still have cute stuff to wear. As they got older I did less storing because instead of cute outfits everything became athletic shorts and T shirts. And they wore uniforms to school so not much variety there. I had an older son/younger daughter combo so the only hand me downs that worked were neutral baby stuff and basics like turtle necks. I did my best to reuse my stuff for the second. I used to laugh that my daughter wore more of her brothers old things than my 2 nieces wore of each other’s things. My sister in law was not a fan of handing down from one to the next even though her girls were close in age and basically same season. Because of your blog post last year, my kiddos had “new” shorts last spring. Since they are in the stages of growing often, I knew there was no way they would fit into them that fall. My kids often have growth spurts off-season. Haha! I cut their pants into shorts for the summer like you had suggested in another post. They LOVED that idea!!! And to my son who gets very attached to every piece of clothing, it made him happy to have them a bit longer. I pretty much transfer my oldest son’s clothes to my youngest son’s wardrobe since they were born in a similar season. My oldest son is very thin, but my youngest is thicker waisted. So that works out nicely. But I’m with you. If you don’t have to save extra for the sake of saving extra, get it out. I donate all of my daughter’s clothing, and she is really good about helping me go through stuff!!! haha — so funny! Our kids LOVE cutting pants into shorts. In fact, I just went into James’ drawers over the weekend and pulled out his too-short pants. I have a little pile next to my sewing machine to make into shorts for him this summer! I can’t buy ahead with my 3 year old. She is very particular about what she wears and if I buy ahead of time, she may or may not wear it. I just take her shopping so she can pick up what she would like to wear. Once she outgrows it, I give the clothes that are in good condition to a friend of mine whose daughter is exactly a year younger than mine. She usually takes everything and then either sell or donate the items that do not work for her daughter. yup, this is exactly how Nora was (and still is)! I don’t ever buy ahead , but with 5 boys ( 3 who were born the exact same time of year) I save everything ! It’s a pain to constantly be cycling through clothing sizes, but it definitely makes the most sense for us ! yeah… if I had 5 boys so close in age, I’d DEFINITELY be saving clothes!! I have always bought way ahead for our son. Even long before we knew we were having him, I had a closet full. I am not a last minute person, I have to be prepared and plan ahead or my mind goes into overdrive. We only have the one child. He doesn’t really ruin any clothes, so anything that he grows out of I donate to Goodwill. I am super picky about what he wears, so I constantly watch at our Goodwill’s and at Once Upon a Child and buy the next size he will need and the brands I know hold up well. I always have a stash of the next size waiting in his closet. We live in the midwest too. I do change out our clothes each spring/summer and fall/winter. Basically from shorts and short sleeves to pants and long sleeves. I keep all his extra clothes in his closet separated from the current stuff. My buying ahead is two-fold. 1) I DO NOT want to pay full price for brand name clothes. Like I said, I am picky about what he wears. I don’t like certain colors, brands, etc. Shopping ahead and keeping my eye open allows me to pay only a few dollars per item for good quality stuff. 2) I like to be prepared and have things ready to go for the next season/sizing up. My son is on the smaller side for his age, so his clothes last him quite awhile helping he get even extra mileage out of them. So, rarely have I had clothes wasted and not be able to be worn. I just mentally work best this way. I never like waiting for the last minute for anything I can plan ahead for. sounds like you have a great system that works really well for you! Thanks for sharing! Wow! You must have fantastic thrift stores! Instead, I am very blessed to have a few friends that give me hand-me downs for the 4yo. 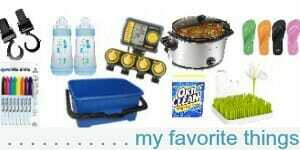 Other than that, I can find better deals at Target, Fred Meyer and even Carter’s (Factory Outlet) – clearance and sales, sometimes coupons – than thrift. 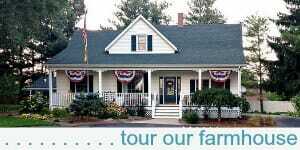 yes, we DO have fantastic thrift stores! it’s so nice! I am with you Natalia, our thrift stores here are high priced. When the kids were little I used to hit target after season and get new shirts for .50 cents. Cheaper than thrift. Our thrift stores and consignment sales here are very expensive too, target clearance is usually cheaper. I do save clothes since I have three girls all born at same time of year, but I understand reasons not to after all the bin-sorting I do twice a year to pull out the sizes we need/put away the sizes we don’t. I’m super lucky….my girls are 8 and 6 and have birthdays 5 days apart and my boys are 2 and 4 and have birthdays 3 weeks apart. It totally works saving clothes and I dont mind storing. But as soon as my 6 yr old and 2 yr old outgrow something I donate or throw away and it feels great! that’s great! We have friends with basically the same exact situation. It’s so nice for sharing clothing! A local-to-me thrift store that supports our local Christian school recycles clothing and gets paid per pound. This is great for anything that has lots of holes or is stained-it’s out of my house AND the thrift store gets paid to take it from me AND it’s being recycled! wow — so cool that you figured this out! Where do you thrift shop by you? I head to Grandville once a week to visit shut ins and have a new niece I would like to shop for. Sometimes we head to Jenison or even Hudsonville for lunch and I would love to know what’s out in your neck of the woods. I do find deals at Goodwill or Salvation Army, but their prices keep sliding up. Once Upon a Child isn’t bad, but not convenient to where I live and travel around too. I would love to check out new stores with our weather hopefully becoming springy again! Thanks Andrea. We LOVE Revive in Hudsonville — it’s amazingly well stocked and organized! I don’t buy ahead but I definitely store too-small kids’ clothes and don’t mind it (5 kids, 7 and under). Sure, it’s an afternoon chore to swap out seasons or sizes, but it saves me time in the long run. 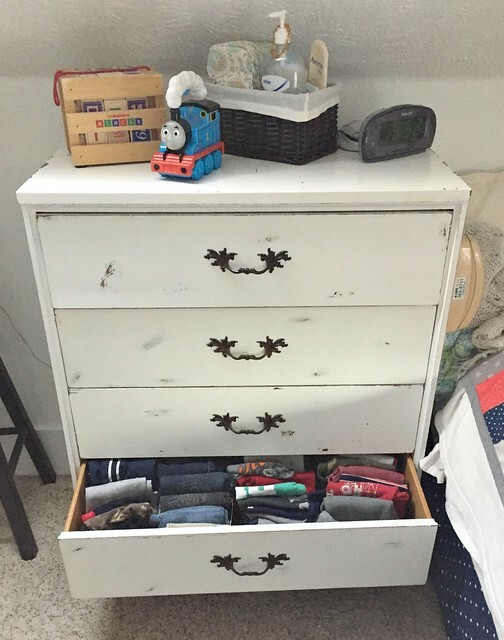 We don’t have good thrift stores around here (and the ones we do have have nothing in terms of kids’ clothes) and my three oldest kids share one dresser so we don’t have room to store off seasons. (We do have a HUGE walk-in closet, so we have plenty of space to store plastic bins in a climate-controlled environment.) I also work full time, so time (of shopping for new clothes) is more important than the space taken to store clothes. I also keep my maternity clothes because I’m pregnant every 18-24 months and it’s easier/cheaper to store a bin of maternity clothes than rebuy every 2 years. Excellent point about storing clothes for long periods of time – the stains. It’s like they magically appear. Another problem with storing clothes for longer periods of time is the elastic in the pants dries out and makes the pants or shorts no longer usable. yes, I’ve already purchased clothing from a thrift store and realized (after we got home) that the elastic is bad… grrr. bummer — and yes, we have friends who had rodent issues in all the things they were saving for potential future babies. They ended up needed to trash it all and buy over again when they had their 2nd baby. When my daughter was little my friend and I had four girls within four years of each other. She would pass her oldest girl’s clothes to me and I would pass them back to her in time for her second and third girls to use them. The time span was close enough that everything was still relevant and the girls weren’t too hard on the clothes so they still looked good even when the fourth girl was wearing them! This was me & my sister in law! It was great! We had 5 girls between the 2 of us but the youngest 4 traded clothes back and forth for years. We joked that if we played our cards right maybe we could get away with only buying one wedding dress one day! Ha! wow — this is awesome! So much time and spaced saved!! When mine were small, I often found myself just “trading” at the thrift shop. I did keep a few hand-me-downs that were cute, but I also dislike storing lots of items of any sort. I had a boy and a girl who did not wear many of the same items, too. yes, trading at consignment stores are great options for reducing the amount of stuff we need to store in our homes! I had 3 boys in 2.5 years and as they’ve gotten older they are all nearly in the same size clothes especially shorts. I watched a YouTube video talking about the savings vs the space items take up in your home for use “one day”. So now I buy a small amount when they need it and don’t have the stress of keeping on top of stored clothing ! We do live in Australia and pretty much have one season all year – Hot ! that’s awesome that they are all the same size. I had 2 younger sisters and for a while, we were all the same size too — LOTS of shared clothing! As a general rule, I do a lot of buying ahead and handing down. I know that my kids (boy – 5 yrs, girl 4 yrs, girl 2 yrs) typically need 5 pairs of pants, 5 pairs of shorts, 5 long sleeve t-shirts, 5 short sleeve t-shirts, 3 church outfits, a couple sweaters, and a couple pairs of swimsuits. (more sweaters in the winter and less pants in the winter). Once they’ve gotten to two years old, they seem to take about a year to grow into the next size. So, I purchase those items when I find good sales. I usually am able to buy their clothes for $3 an item. The thrift stores around me aren’t great and they typically run $2-4/item. 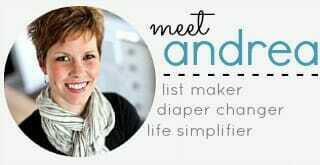 Thredup is even worse. Their prices seem really high. So . . . 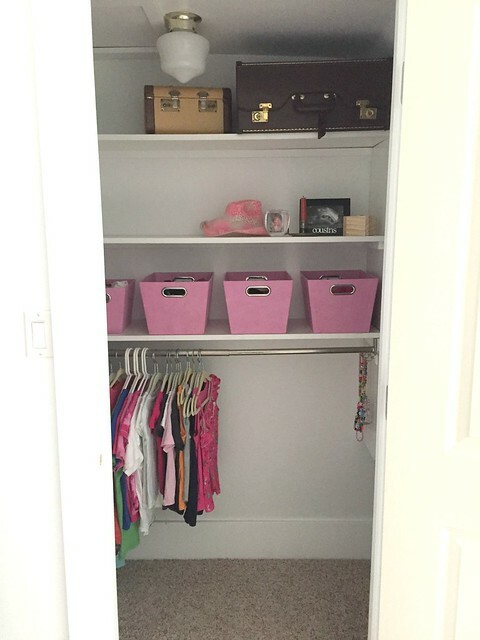 I have a row of storage boxes in one of our closets that holds sizes 2T – 6T. When I find something for a good price – $3 or less – I buy it and stick it in the appropriate storage box. Then, when my kids are ready for the next size, we have their clothes ready to go. Anything my son grows out of goes to my nephew. Anything my youngest daughter grows out of goes to the thrift store. this sounds like a fantastic system — thanks for sharing! We do something similar with 5 pants, 5 shorts, etc. (at least for the boys). 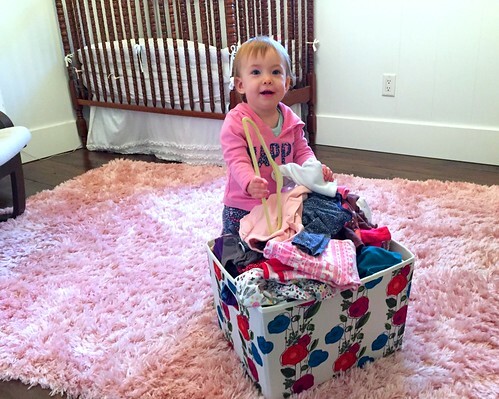 Nora gets TONS of clothing given to her from neighbors and friends, so she has lots of clothes! I switched to this method after failed attempts to save money by buying clothes and shoes months ahead. The worst for me was shoes–my daughter is very picky about how shoes feel on her feet. I would find some cute styles that I was positive she’d love, but when it came time to wear them she wouldn’t like how they felt. Lesson learned! I also find that grandparents gift us a lot of clothing at random times of the year. One tip I could add: I take a lot of our clothing with holes/extreme wear to Goodwill for their textile recycling program. They take clothes in any condition that would otherwise end up in the landfill.